Today's post is in honor of a good blog friend, one who lost her oldest son just over a week ago. Hallie, your CJ is loved and missed. I've been praying for you and your entire family since hearing the news. The following was written by Hallie's close friends, Dayna and Kimmy. Please show your support of the Twomey family and head to Hallie's blog, Wonderful World of Wieners, to see what you can do? Words are at times, inadequate, and often hard to come by.This is the hardest thing we have ever had to write. 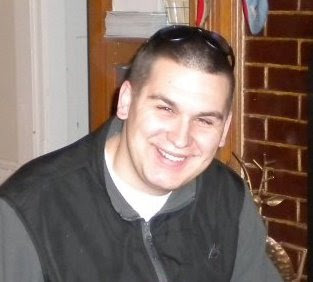 It is with deep sadness that we tell you that on April 15th, Christopher John “C.J." Twomey, the beloved son of Hallie and John, big brother to Connor, passed away unexpectedly, leaving behind his heart-broken family and friends. Please take a moment to read his obituary. In the middle of all their sadness, Hallie and John were able to find the strength to write a beautiful and loving tribute to their amazing son. Those who loved C.J. are left to miss his infectious smile, to wish to hold him again, to have him saunter into a room and make us all laugh. We wish we could talk to him, to watch him love the way that he did, with his whole heart. In short, those who loved C.J. are longing for the future we were all supposed to have with him. Hallie and John are heart-broken, are struggling to understand the events of the past week and are focusing on making sure their son Connor, who has shown grace and maturity well beyond his 16 years, knows and feels the love of his parents at this very difficult time. Hallie, John and Connor have received an overwhelming amount of support over the last week from friends nearby who have stood with them through horrific circumstances, to the calls of support and the messages sent through text, email,Facebook and many other mediums. They know that so many of you are hurting as well. Even in the mist of incomprehensible pain, Hallie and John continue to think of others. Despite their own pain, they remembered the pain of Hallie’s dad as he was waiting for a heart and became a recipient himself. In C.J. 's final hours, Hallie and John made the heroic decision to donate his organs. This week, 56 families felt the joy of hope for their family, even in the darkest moments forC.J.’s family. Pray for comfort. Hallie, John, Connor and their extended family have pain that is indescribable; please offer up prayers that comfort can come to them. 2. Continue to send messages of support.The messages of support they have received mean more than they can express right now. Messages sent throughFacebook, her Blog, or for those who have the ability, text messages of support are appreciated. While they are not able to respond, they are reading them, and it does lift them in support when one more step or one more breath seems like it’s just too much to take. 3. Make a donation. Kimmy and I have set up a fund called the "Twomey Family Benefit” for the family to use as they see fit – for funeral expenses, for a memorial for C.J. or maybe even to just be able to get away as a family and spend time grieving the loss of their beloved son.Many of us felt the need to do SOMETHING, and being far away, and knowing that we can't take away the emotional burden, this felt like something we could do to help. The checks should be made payable to the: “Twomey Family Benefit” and should also include those exact words in the memo line of the check. We know that this time, for all of us, is shocking and difficult to comprehend a life cut so short. We hope and pray that you can take a moment to hold those you love tight, tell them you love them and cherish every moment. Love like C.J. did, with his whole heart, and give to others freely. So so sad and I wish we could make it all be better for them. I keep them in my prayers daily. I have no words other than they have been in my thoughts and prayers. this is very sad Flea. I am so sorry. So very heartbreaking. I know their pain and will keep them in my prayers. So sad. I just heard.